The Mid South Coast Amateur Radio Club’s newsletter, Lyrebird, was recently published with a mention of their club’s involvement in the 2016 Ferry Contest. 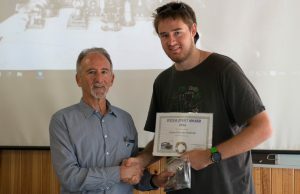 Connor Edwards (VK2FCAC) attended the Waverley Club regular Project Day on Saturday 5th May in order to receive his Ferry Contest check-in award. Laurie Gordon (VK2GZ), contest manager, presented the award consisting of a certificate and one of the club’s Power Pole kits. Next year’s Ferry Contest will be held on Sunday 12th March. Further details will be posted to the website closer to the event. It’s the Ferry Contest Tomorrow! I am looking forward to the Ferry Contest tomorrow. Only a few hours to go. I was thinking about packing my bags and what I should include. The weather looks like it could be hot at around 29 degrees and there is always a risk of a late shower or storm. With that in mind here is my list below. God luck for those who are participating. I hope to hear you during the day. Further details at the Ferry Contest page.